Simple and graceful, our Ashdown dining sets are a popular choice. 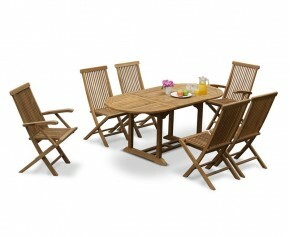 Featuring fold up chairs with slated seats and backs, these Ashdown dining sets are as practical as they are stylish. Made out of the finest grade-A teak, our teak dining tables are guaranteed extreme durability and longevity. Able to withstand any weather condition, these teak dining tables can remain outdoors all year round with minimal maintenance required. This beautiful teak table and folding chairs are ideal to use as patio furniture or for al fresco outdoor dining - the possibilities for this versatile teak garden furniture set are endless! This stunning teak table and folding chairs set represents brilliant value for money and is ideal to use as patio furniture or for al fresco outdoor dining. 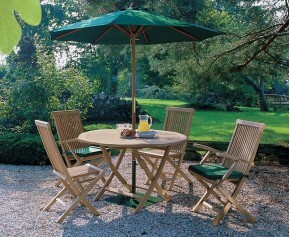 Often featured in magazines, this Ashdown folding round garden table and arm chairs set is a garden favourite. 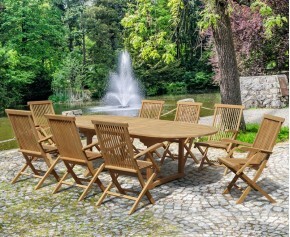 Expertly manufactured in sustainable A-grade teak, this folding round garden table and arm chairs set has been built to last and can be left outdoors all year round with minimal fuss. 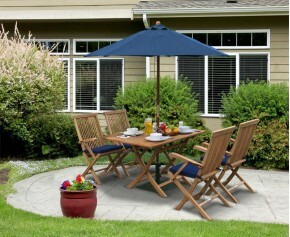 Delight your guests with this outdoor foldable table and arm chairs set. 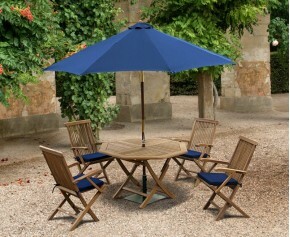 Expertly constructed to the highest spec in sustainable A-grade teak, this outdoor foldable table and arm chairs set has been built to last and can remain outdoors all year round with minimal fuss, ensuring stress-free fruitful use for years to come. 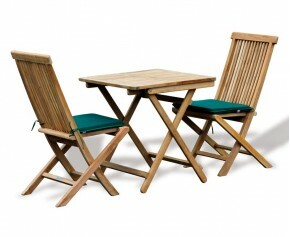 This garden folding dining table and arm chairs set is set to impress. Combining the benefits of practicality and style, this garden folding dining table and arm chairs set provides numerous options for garden dining and is perfect for entertaining your guests during long afternoons spent in the garden. Modestly sized to fit most garden spaces, this stunning rectangular garden folding table and chairs set can be utilised without sacrificing a great deal of space. 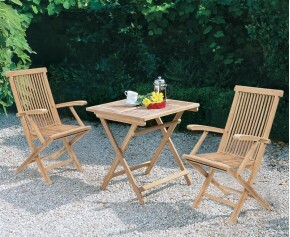 Expertly constructed in sustainably sourced, genuine Grade-A teak, this 4 seater garden dining set is robust, hardwearing, functional and can be left outdoors all year round in any weather. 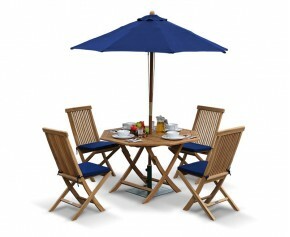 Delight guests with this folding round garden table and chairs set. Expertly constructed in sustainable Grade-A teak, this robust folding round garden table and chair set has been built to last and can be left outdoors all year round with minimal fuss, ensuring stress-free fruitful use for years to come. A garden favourite, this rectangular folding garden table and chairs set can be utilised without sacrificing a great deal of space. 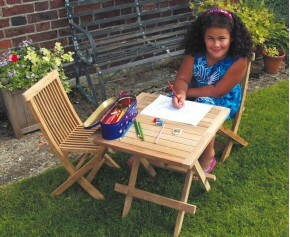 Expertly manufactured in plantation grown grade-A teak, this rectangular folding garden table and chairs set is robust, stylish, hardwearing and can be left outdoors all year round with minimal maintenance. 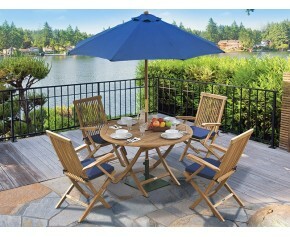 Delight guests with this great value rectangular folding garden table and chairs set. Modestly sized to fit most outdoor settings, this Shelley rectangular folding garden table and chairs set can be utilised without sacrificing a great deal of space. 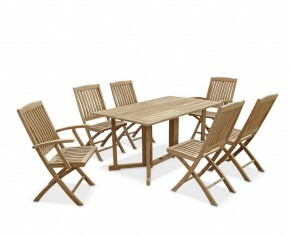 We offer a wide range of Ashdown dining sets, so you can choose which style suits your purpose best. 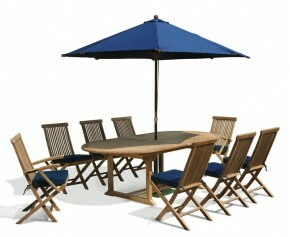 Our Ashdown dining sets are comfortable and provide plentiful space for al fresco dining. 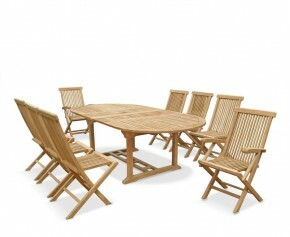 Wonderful as a focal point, these teak dining tables are high quality and perfect for your space. 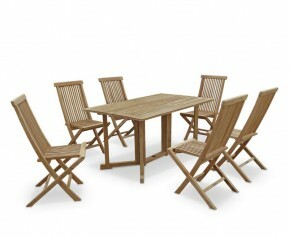 View our range of Ashdown dining sets here.